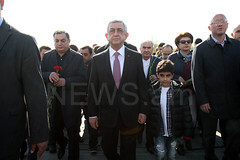 YEREVAN.- Armenian Prime Minister received on Wednesady Charles Aznavour’s son Nicolas Aznavour who is the co-founder of the Aznavour Foundation, and CEO of the Foundation Kristina Sarkissian, the PM’s Office reported. During the meeting, issues relating to the activity of the Aznavour Foundation, in particular, the first cultural project – the creation of Aznavour Center in Yerevan, were discussed. Charles Aznavour's interactive, technologically-rich museum and a unique educational-cultural center for youth will operate in the Center. 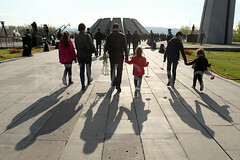 Nikol Pashinyan noted that the construction of the Center in Yerevan is the tribute of the Armenian people and Armenia to the memory of the great Armenian. Pashinyan expressed his support to the implementation of the project developed personally by Charles Aznavour and tasked the responsible officials of the relevant agencies to closely cooperate with the Azanvour Foundation on this direction.